Your Gateway serial number and Customer ID will help your support tech to obtain important information about your system. 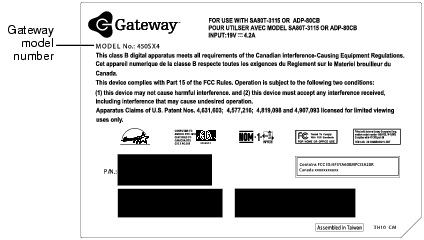 The model number of your Gateway computer is also very important. All of this information will be on a sticker on your computer. Remember, the more information we have, the better we can serve you. Your serial number sticker will be found on the top, side or back of your computer. On some models, it will be on the inside of the hinged lid covering your CD drive. This information is also included on the invoice shipped with your Gateway machine. It will look something like the one shown here.